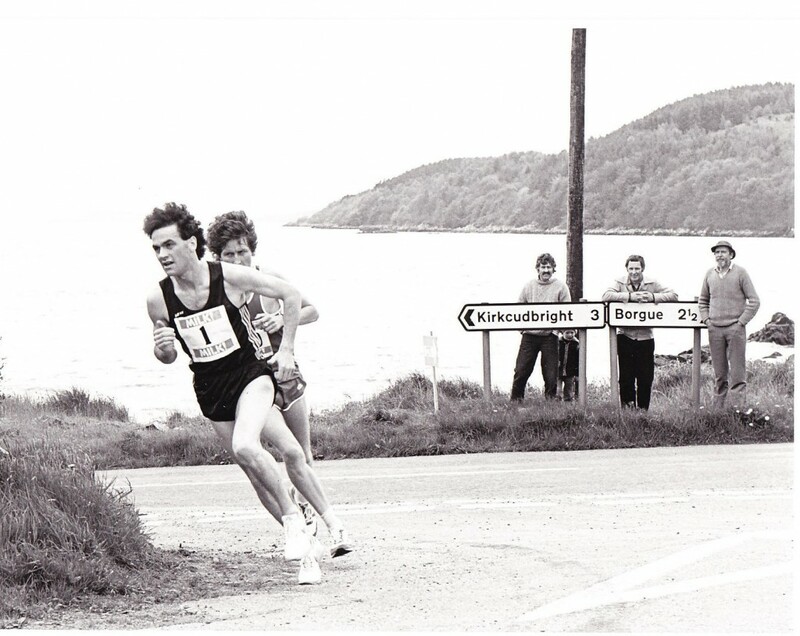 Mike Carroll leading Graham Crawford in the Kirkcudbright Half Marathon in 1986. Mike Carroll (28 June 1958) was an excellent distance runner on the roads and on the track who was one of the country’s best marathon runners. I only met or spoke to him once – when he ran in the Scottish team which took part in the international fixture to open the new track at East Kilbride. He was perfectly affable, friendly and sociable but went for his warm-up run before the race and took so long to return that there were fears that he might miss the actual race! Teamed with Adrian Callan, he ran very well indeed though. Mike was a talented runner who would disappear from the scene for a year – or maybe longer – then come back running as well as ever. It was as a roadrunner that he is best known and that is where most emphasis will be placed in the profile but we can start with a look at his places in the rankings over a ten year period which show the range of distances covered with some distinction. Ranked first for the 10000m in 1989, second for the same event in 1990 and third in the marathon in 1993. Not bad statistics but his competitive record was also very good with two victories in the Scottish half-marathon championships plus medals in the 10 miles and 10K championships. Unfortunately for all his ability he only ran in one Edinburgh – Glasgow Relays – one for Annan in 1990 where he ran sixth fastest time on the second stage/ He took up the sport in his Twenties because he had a brother who was a runner and there were lots of races then with thousands of competitors, it took his fancy and, as he wanted to get fit he started running. Mike’s breakthrough year was 1985 with three very good marathons and that’s where we will start. In the Great Scottish Run of 30th September 1984, Mike Carroll was thirteenth in 2:19:19 following immediately behind fellow Scots Tony Coyne and Jim Brown. Despite running under the name of ‘J Warwick’, this late season marathon may well be what won him his first Scottish vest the following year. At the time however it got him into a lot of trouble with the authorities. It was the first of the really big Glasgow Marathons, there was a lot of coverage on the BBC and, running under an assumed name, he led for the first half of the race. The Scottish authorities were not at all happy and they let him know it. Be that as it may, Mike’s first marathon of 1985 was as part of a Scottish team competing in Barcelona on 17th March. The ‘Glasgow Herald’s headline read: MARATHON MEN TAKE TEAM TITLE and it went on to read, “Scotland took the team prize against top Continental opposition in the Barcelona Marathon with three runners finishing in the first six. Scottish Internationalist Paul Kenney (Birchfield Harriers) finished runner-up in 2:18:34, just 18 sec behind the winner, Raphael Garcia-Perez of Spain, with Glasgow dentist Tony Coyne (Bellahouston Harriers) third in 2:21:33. Mike Carroll (Annan and District) running in his first international race finished sixth in 2:22:31.” And that was the entirety of the report. Barcelona was always a good race for Scots on a fast course and not too much travelling involved. It was a good debut for Mike very early in the season. “Mike Carroll of Annan and District, who represented Scotland in the recent Barcelona International Marathon, won the Kirkcudbright Academy Milk Half-Marathon when defeating 500 rivals in 1 hour 5 min 52 sec.” ‘Glasgow Herald’, 27th May. The ‘Glasgow Herald’ of 2nd September, 1985 had this report in the ‘Results in Brief’ section: “Only 2000 runners finished the Edinburgh Waverley Market Marathon out of a total of 3300 entries. The winner was Mike Carroll, a 27-year-old production engineer from Annan, in 2:18:41. In 61st place overall was the man who the Commonwealth Games gold over the same classic distance in Edinburgh in 1970, Ron Hill, who recorded 2:48:15. The first woman home was Heather McDuff of Edinburgh AC.” And that was the report in its entirety. Hardly fulsome but it was a different story later that month. As it turned out, the Sea of Galilee Marathon was won by a Scot – but by Lindsay Robertson and not Mike Carroll. In fact Mike did not run in Tiberias at all that year because of injury – he was to have some recurring injuries to his hamstring and calf which would keep him out for quite long stretches of time. He also worked shifts and had a young family which also affected how much running he could do. He was coached for a time by Gordon Surtees, who also coached Tom Hanlon, in the North of England who sent him schedules by post which he had to follow. Unsurprisingly, Gordon was not a big fan of Mike’s shift work but that was the way it was. He was also put in touch with Gerry Helme, the agent, by Hammy Cox. Helme got Mike several races abroad notably two in Amsterdam. Again, what races Helme could get were complicated Mike’s shift work and family commitments. Mike did not run in the 1986 London Marathon in April where Allister Hutton in third place was top Scot in a time of 2:12:36. The first major appearance for him in 1986 was in the Pearl Assurance Half-Marathon in Edinburgh on 4th May. Neil Tennant won the race in 64:41 with Australian Laurence Whitty second and England’s Bernie Ford third. Tommy Murray was fourth and Mike was fifth in 66:21, six seconds behind Tommy. Then it was on to one of his favourite races – the Kirkcudbright Milk Half-Marathon on 24th May which he won and was reported in the ‘Herald’: “Scottish international Mike Carroll of Annan and District AC, won the Kirkcudbright Milk Half-Marathon from 300 competitors and led his club to victory in the team race. Carroll set a course record of 63:22 when winning for the second successive year with Graham Crawford (Springburn Harriers runner-up in 64:27.” On 3rd June Mike won the Lockerbie Gala 6 Miles in 28:17 from club mate Rob Carey who ran 29:34. With the Commonwealth Games being held in Scotland in 1986, there was massive coverage of that and then of the European Games a few weeks later which led automatically to a shortage of reporting on other athletics events but it is clear that 1986 was not as good for Mike as 1985 had been. In 1985 he had been ranked in every list from local, to national to British rankings but he was nowhere to be seen in 1987 at all. Even the many local races in Annan, Dumfries, Lockerbie, Kirkcudbright and even Ecclefechan were being won mainly by his clubmate Rob Carey. ‘Scotland’s Runner’ for April 1988 had an article called ‘Focus on Dumfries and Galloway’ which noted the main races and the illustration on the page was a good picture of Rob Carey in action with the caption reading ‘Annan’s Rob Carey – the local man to beat in Dumfries and Galloway’s road races.’ The only reference to Mike was a single sentence on the Dumfries half-marathon pointing out that Mike Carroll set the course record in 1985. Well, Mike answered that on 24th June with his third victory in the Dumfries half-marathon in 65:42 – the second fastest time ever and one which has only been bettered twice in the 24 years since then. Other than that though, the only time credited to him was 14:15.3 for a track 5000m which placed him ninth in the national rankings. 1989 was even faster for the Kirkcudbright half marathon with a victory over K Moss of Chorley in England and Andy Daly from Bellahouston in yet another record of 63:55 from a field reported to be over 300 strong. A hint as to why he was out of action for so long was in the comment in “Scotland’s Runner” was “The fastest time by a Scot to date this year was recorded at the Kirkcudbright Academy half-marathon, Mike Carroll of Annan established himself well clear of injury problems to complete the course in 63:55. 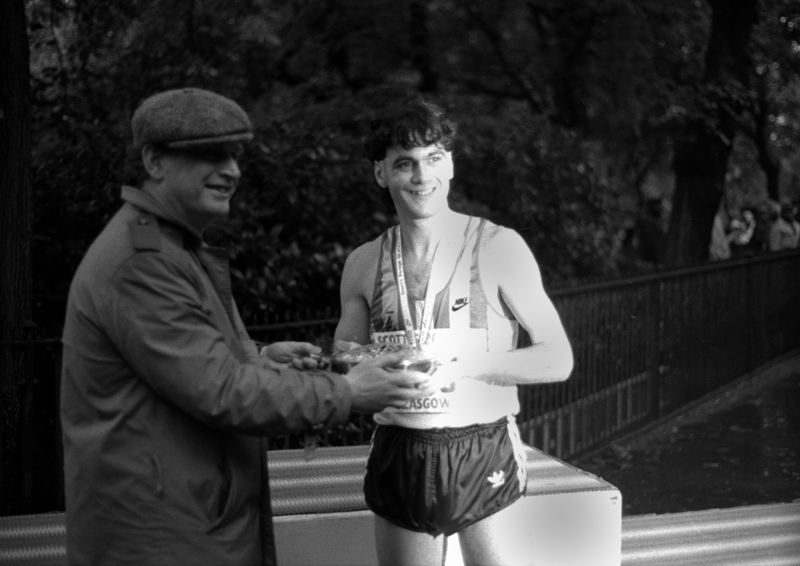 Ken Moss of Chorley was second man home and Bellahouston’s Andy Daly was third.” 1989 was also the year that he took to the track with success. In the SAAA 10000 metres championships he lifted a silver medal and again “Scotland’s Runner” reported. “Kevin Forster of the new Tyneside club, Valli Harriers, went through the halfway mark faster than many of those in the 5000m leading home a field of runners with Annan’s Mike Carroll the surprise package. He returned from prolonged injury to win his first championship medal less than a week after buying his first pair of track spikes. Result: K Forster (Valli) 29:08; 2. M Carroll (Annan) 29:22.” This time placed at the top of the Scottish 10000m rankings for the entire year. The time and the manner of doing it saw him selected for the international match organised to open the new track in East Kilbride. He ran in the 5000m with event winner Adrian Callan. Callan was timed at 14:11.2 and Mike at 14:15.3 which, at the end of the season, had him rated eleventh in the country. There were two more races of note for him in 1989. On 25th June he ran in the Dumfries half-marathon which he won in 65:42 – a new course record and his second of the season – from R Hall of Teviotdale who was over four minutes behind in 69:48. On 6th August he travelled to Cramond in Edinburgh for the 10 miles road race which he won in 48:11 – a course record, the third of the season – from Fraser Clyne of Aberdeen who was over two minutes adrift with 50:23. By the end of 1989, Mike Carroll was back in action and injury free for the first time in several years. Mike ran more races in 1990 that he had done in the past three or four years combined – and with great success. He started the summer with a win and a course record in the Selkirk People’s Half-Marathon in 66:43 from Alan Robson (ESH: 67:35) and three weeks later was third in the Glasgow Brightside SAAA 10K Road Race where he was behind Geoff Turnbull (29:21) and Gary Nagel (29:23) – both Valli Harriers) – in 29:59. On 3rd June he won the Irvine Valley Halh-Marathon from Galston by more than 5 minutes in 62:19 with Gordon Tenney of Kilbarchan second in 67:38. On 10th June the Scottish People’s Half-Marathon was held in Dunfermline and Mike won in a new course record of 66:48. The report in Scotland’s Runner said “Mike Carroll won the Scottish People’s Half-Marathon when it was held for the first time as part of the Dunfermline Half-Marathon on June 10th. Carroll’s time of 64:48 was more than two minutes inside the 198 winning time and 80 seconds ahead of Dundee Hawkhill’s Ian Campbell (66:07) who was himself almost a minute ahead of third placed Fraser Clyne (Aberdeen). On 24th June, he missed the Dumfries Half-Marathon where he would normally be found because he was running in a 10000m in Austria for Scotland. The race in question was in Kapfenberg and Mike was eighth in 29:59.43. He also missed the SAAA Championships which were immediately afterwards on 27th/28th June. However he was back on form again on 1st July when he won the Cumnock Half Marathon in a new record of 63:54 from Billy Nelson of Law and District (67:38). Two weeks later (14th July) he was at the other end of the country setting a course record at the Inverness 10K which he won in 29:30 from Bruce Chinnick (29:48). On to the end of August when hw was second in Livingston. The report reads: “Ieuan Ellis of Wales won the Livingston International Half-Marathon from over 800 runners, but his time of 64:57 in warm conditions never looked like threatening the £10,000 on offer for the winner if he broke 62 minutes. Second was Annan’s Mike Carroll who had been leading until the eight mile mark, in 65:34. Carroll, Ian Campbell and Hammy Cox won the team event for Scotland.” On 16th September he was second in the Land O’Burns Half Marathon in a torrid race with some of the country’s very best road runners. The first few places: 1. P Fleming (Bellahouston) 64:18; 2. M Carroll (Annan) 64:50; 3. Ian Campbell (Dundee Hawkhill) 64:57; 4. T Murray (Greenock Glenpark) 66:34; 5. G Croll (EKAAC) 66:53; 6. D Frame (Law) 67:36. He also ran well on the track in 1990 and was ranked in three events In the 3000 he ran 8:17.9 to be 18th, at 5000 he ran 14:19.76 to be 13th and in the 10000m 29:59.43 was good enough for 2nd. 1990 was also the year of his first run in the Edinburgh to Glasgow. After several years out of the race, Annan & District AC competed in 1989 without Mike and finished twenty second of twenty two teams, nevertheless they were back the following year. He was on the second stage, taking over from Rob Carey, whose 16th place must have been a disappointment to the club as well as to Rob. Mike could only gain one place pulling the club up to sixteenth and the team eventually crossed the finishing line in eighteenth. 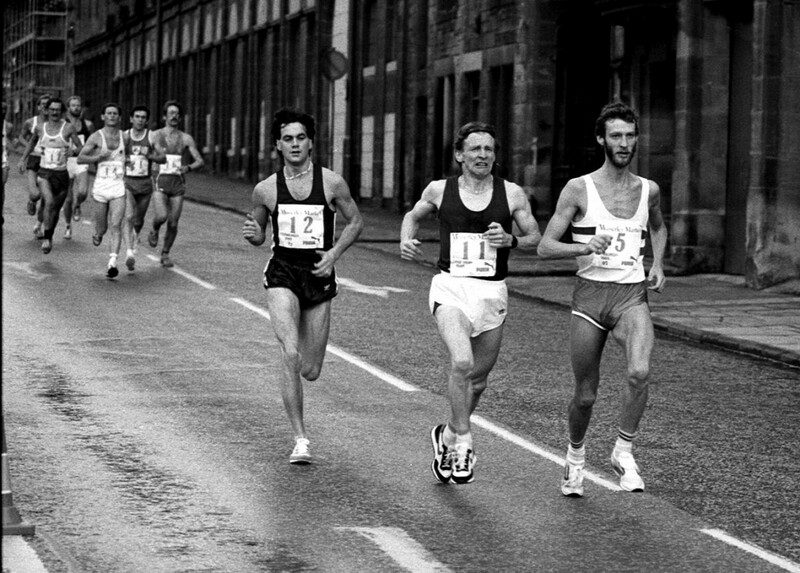 In 1991 it seemed that Mike was back suffering with his injuries again – after a good April with second in the Selkirk Half-Marathon (which was 155 yards short) to John Robson (62:12) with a time of 62:39, he next appeared on the first Wednesday in September after winning the Dumfries 10K in 30:11 which was the first of four victories in five years in this event. He was not in the rankings at all nor did he run in most of his ‘regular’ events. “Scottish marathon internationalist Mike Carroll produced a fine piece of front running to win the first major road race of the season, the Tom Scott Memorial. Contested over a ten mile course from Law Village in Lanarkshire to the finish in Strathclyde Park, the 33-year-old Annan runner finished in 48:05, a convincing 50 seconds ahead of Cambuslang’s Charlie Thomson with Edinburgh Racing Club’s Brian Kirkwood in third. This was the thirtieth year of the Tom Scott Memorial, held in memory of the Motherwell club runner who used to run to work every day between Law village and the town before he was tragically killed in a car crash in England. The 1991 victor, Nat Muir, was forced to pull out shortly before race day through injury. That started an excellent season. His best run of the year ranked him ranked third Scotsman for the half-marathon distance with a best for the season of 63:48 when he won at Haarlem on 18th October. The only other home Scot to run quicker was John Robson with 63:27, run in Selkirk on 19th April. Mike had three other times listed that year for the distance and they were 64:09 finishing 57th at South Shields on 20th September, 64:31 when coming second to John Robson at Selkirk in September and 65:00 for victory at Coatbridge on 2nd August – this last was yet another course record. He had three times faster than fourth placed Peter Fleming’s best of 64:45. One half-marathon time not in the rankings was for the Dunfermline Half Marathon where he was a previous winner. This time it was a race against his old rival, Terry Mitchell. “The cool, misty conditions at the eighth Dunfermline Half-Marathon may not have been ideal for the large crowd of spectators but they certainly worked to the benefit of the runners. The men’s race was scooped this time by Fife AC’s Terry Mitchell in a record of 66:49. Mitchell tailed Annan’s Mike Carroll (who won the event on a slightly different course two years ago in 64:48) for almost ten miles before taking up the front running position. Though never seriously challenged by Carroll thereafter, the two remained within several hundred metres of each other to the finishing line. Carroll’s time, 67:10.” He won the Annan and District 6.75 miles Road Race on 24th June in 32:05 from Steve Binns, an English and British athlete who had moved to Scotland and joined Annan and District, by two second. He finished the summer season with another record – in the Dumfries 10K on the first Wednesday in September for the second time in 29:25. 1992 was also notable for two silver medals in Scottish championships: on 31st May Mike was second in the 10 miles championship at Glenrothes behind Terry Mitchell in 51:42 to Mitchell’s 51:17. Then on 12th July he followed David Donnet (Springburn) home in the Scottish 10000m championship with 30:23, nine seconds down. Mike retired from racing at the age of 37 – actually he says he retired three or four years before that but he was being ribbed by friends that he couldn’t run any more and so on, so he ran in the Dumfries 10K in 30:30. When Mike looks back on his athletics career he can be really proud of his achievements: many very good times, many good head-to-head wins against some of the very best and Scottish vests on the road, country and track. We could do with him back running at that standard today.